Instagram’s new update is now available with new features like stickers to your Stories and shoots hands-free video. The stickers consist of both dynamic content and static images. Also, you can use multiple dynamic stickers at once as well as both can be rotated and resized. There is now a new button on the top right when editing a Story image to access the stickers. You can scroll through a list of Instagram stickers and all your device’s emojis. However, you cannot add stickers to normal Instagram posts, just Stories. Finally, you can now simply press the button once to record and press again to stop. The hands-free mode shows up as a mode on the main Stories screen, at the bottom of the screen. Stickers: No matter where you are or what you’re up to, you can add context to your story with stickers. 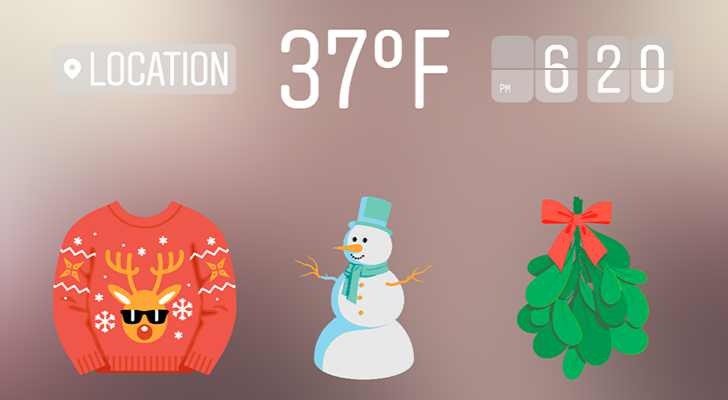 Holiday Fun: Make your story more festive with holiday stickers and a candy-cane brush. Hands-Free Video Mode: A new option in the format picker lets you record a video without having to press and hold. Text Enhancements: Add as many pieces of text as you’d like to a photo or video by tapping the text button. Save Story Video: You can now save your entire story from the past 24 hours to your camera roll as a single video. Instagram’s new update is now rolling out to iOS and Android devices. Download the app from the link below.